Olivia Mary de Havilland (born July 1, 1916; age 101) is a retired American actress whose career spanned from 1935 to 1988. She appeared in 49 feature films, and was one of the leading movie stars during the golden age of Classical Hollywood. She is best known for her early screen performances in The Adventures of Robin Hood (1938) and Gone with the Wind (1939), and her later award-winning performances in To Each His Own (1946), The Snake Pit (1948), and The Heiress (1949). Born in Tokyo to British parents, de Havilland and her younger sister Joan moved to California in 1919. They were brought up by their mother Lilian, a former stage actress who taught them dramatic art, music, and elocution. De Havilland made her acting debut in amateur theatre in Alice in Wonderland. Later, she appeared in a local production of Shakespeare’s A Midsummer Night’s Dream, which led to her playing Hermia in Max Reinhardt’s stage production of the same play and a movie contract with Warner Bros.
Olivia de Havilland made her screen debut in Reinhardt’s A Midsummer Night’s Dream in 1935. She began her career playing demure ingénues opposite popular leading men, including Errol Flynn, with whom she made nine films. They became one of Hollywood’s most popular romantic on-screen pairings. She achieved her initial popularity in romantic comedy films, such as The Great Garrick (1937), and in Westerns, such as Dodge City (1939). Her natural beauty and refined acting style made her particularly effective in historical period dramas, such as Anthony Adverse (1936), and romantic dramas, such as Hold Back the Dawn (1941). In her later career, she was most successful in drama films, such as Light in the Piazza (1962), and unglamorous roles in psychological dramas including Hush… Hush, Sweet Charlotte (1964). In addition to her film career, de Havilland continued her work in the theatre, appearing three times on Broadway, in Romeo and Juliet (1951), Candida (1952), and A Gift of Time (1962). She also worked in television, appearing in the successful miniseries, Roots: The Next Generations (1979), and television feature films, such as Anastasia: The Mystery of Anna, for which she received a Primetime Emmy Award nomination. During her film career, de Havilland won two Academy Awards, two Golden Globe Awards, two New York Film Critics Circle Awards, the National Board of Review Award for Best Actress, and the Venice Film Festival Volpi Cup. For her contributions to the motion picture industry, she received a star on the Hollywood Walk of Fame. For her lifetime contribution to the arts, she received the National Medal of Arts from President George W. Bush, and was appointed a Chevalier of the Légion d’honneur by French President Nicolas Sarkozy. After romantic relationships with Howard Hughes, James Stewart, and John Huston, de Havilland married author Marcus Goodrich, with whom she had a son, Benjamin. Following her divorce from Goodrich in 1953, she moved to Paris and married Pierre Galante, an executive editor for the French journal Paris Match, with whom she had a daughter, Gisèle. In 1962, she published Every Frenchman Has One, an account of her life in France. 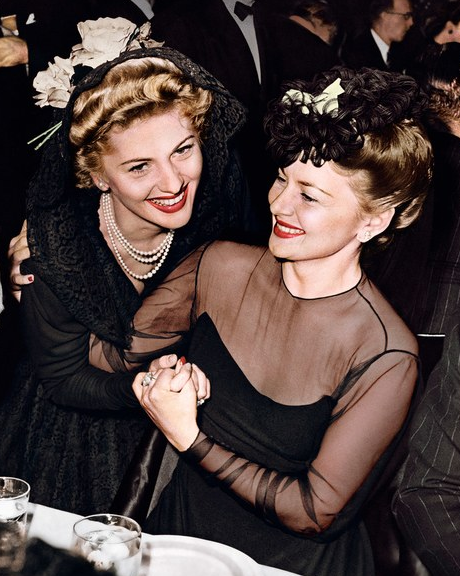 De Havilland and Joan Fontaine are the only siblings to have won Academy Awards in a lead acting category. A lifelong rivalry between the two actresses resulted in an estrangement that lasted over three decades. She has lived in Paris since 1956, and celebrated her 100th birthday on July 1, 2016. De Havilland’s father, Walter de Havilland (1872 – 1968), served as an English professor at the Imperial University in Tokyo before becoming a patent attorney. Her mother, Lilian Fontaine (née Ruse; 1886 – 1975), was educated at the Royal Academy of Dramatic Art in London and became a stage actress. Lilian also sang with the Master of the King’s Music, Sir Walter Parratt, and toured England with the composer Ralph Vaughan Williams. Olivia’s paternal cousin was Sir Geoffrey de Havilland (1882–1965), an aircraft designer and founder of the de Havilland aircraft company. Lilian and Walter met in Japan in 1913 and were married the following year; the marriage was not a happy one due in part to Walter’s infidelities. De Havilland was born on July 1, 1916. They moved into a large house in Tokyo, where Lilian gave informal singing recitals for the European colony. Olivia’s younger sister Joan (born Joan de Beauvoir de Havilland)‍—‌later known as actress Joan Fontaine‍—‌was born fifteen months later, on October 22, 1917. In February 1919, Lilian persuaded her husband to take the family back to England to a climate better suited for their ailing daughters. They sailed aboard the SS Siberia Maru to San Francisco, where the family stopped to treat Olivia’s tonsillitis. 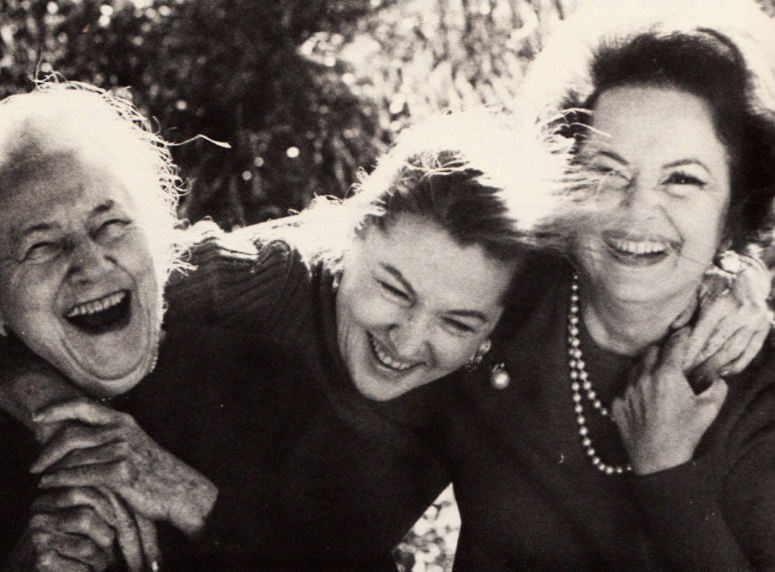 After Joan developed pneumonia, Lilian decided to remain with her daughters in California, where they eventually settled in the village of Saratoga, 50 miles (80 km) south of San Francisco. Her father abandoned the family and returned to his Japanese housekeeper, who eventually became his second wife. Olivia was raised to appreciate the arts, beginning with ballet lessons at the age of four, and piano lessons a year later. She learned to read before she was six, and her mother, who occasionally taught dramatic art, music, and elocution, had her reciting passages from Shakespeare to strengthen her diction. During this period, her younger sister Joan first started calling her “Livvie,” a nickname that would last throughout her life. De Havilland entered Saratoga Grammar School in 1922 and did well in her studies. She enjoyed reading, writing poetry, and drawing, and once represented her grammar school in a county spelling bee, coming in second place. In 1923, Lilian had a new Tudor-style house built, where the family resided until the early 1930s. In April 1925, after her divorce was finalized, Lilian married George Milan Fontaine, a department store manager for O. A. Hale & Co. in San Jose. Fontaine was a good provider and respectable businessman, but his strict parenting style generated animosity and later rebellion in both of his new stepdaughters. De Havilland continued her education at Los Gatos High School, near her home in Saratoga. There, she excelled in oratory and field hockey and participated in school plays and the school drama club, eventually becoming the club’s secretary. With plans of becoming a schoolteacher of English and speech, she also attended Notre Dame Convent in Belmont. In 1933, de Havilland made her debut in amateur theatre in Alice in Wonderland, a production of the Saratoga Community Players based on the novel by Lewis Carroll. She also appeared in several school plays, including The Merchant of Venice and Hansel and Gretel. Her passion for drama eventually led to a confrontation with her stepfather, who forbade her from participating in further extracurricular activities. When he learned that she had won the lead role of Elizabeth Bennet in a school fund-raising production of Jane Austen‘s Pride and Prejudice, he gave her an ultimatum to either stay home or not return home. Not wanting to let her school and classmates down, she left home forever, moving in with a family friend. After graduating from high school in 1934, de Havilland was offered a scholarship to Mills College in Oakland to pursue her chosen career as an English teacher. She was also offered the role of Puck in the Saratoga Community Theater production of Shakespeare’s A Midsummer Night’s Dream. That summer, Austrian director Max Reinhardt came to California for a major new production of the same play to premiere at the Hollywood Bowl. After one of Reinhardt’s assistants saw her perform in Saratoga, he offered her the second understudy position for the role of Hermia. One week before the premiere, the understudy Jean Rouverol and lead actress Gloria Stuart both left the project, leaving 18-year-old de Havilland to play Hermia. Impressed with her performance, Reinhardt offered her the part in the four-week autumn tour that followed. During that tour, Reinhardt received word that he would direct the Warner Bros. film version of his stage production, and he offered her the film role of Hermia. With her mind still set on becoming a teacher, de Havilland initially wavered, but eventually Reinhardt and executive producer Henry Blanke persuaded her to sign a five-year contract with Warner Bros. on November 12, 1934, with a starting salary of $200 a week. De Havilland made her screen debut in Reinhardt’s A Midsummer Night’s Dream, which was filmed at Warner Bros. studios from December 19, 1934, to March 9, 1935. During the production, de Havilland picked up film acting techniques from the film’s co-director William Dieterle, and camera techniques from cinematographer Hal Mohr, who was impressed with her questions about his work. By the end of filming, she had learned the effect of lighting and camera angles on how she appeared on screen and how to find her best lighting. Following premieres in New York and Beverly Hills, the film was released on October 30, 1935. Despite the publicity campaign, the film generated little enthusiasm with audiences. While the critical response was mixed, de Havilland’s performance was praised by The San Francisco Examiner critic. In his review in the Brooklyn Daily Eagle, Winston Burdett noted that she “acts graciously and does greater justice to Shakespeare’s language than anyone else in the cast.” Two minor comedies followed, Alibi Ike with Joe E. Brown and The Irish in Us with James Cagney. In both films, she played the sweet and charming love interest‍—‌a role into which she would later become typecast. After the experience of being a Reinhardt player, de Havilland felt disappointed being assigned these routine heroine roles. In March, de Havilland and her mother moved into an apartment at the Chateau des Fleurs at 6626 Franklin Avenue in Hollywood. In July 1935, Warner Bros. paired de Havilland with an unknown Australian actor named Errol Flynn in the swashbuckler film Captain Blood (1935). 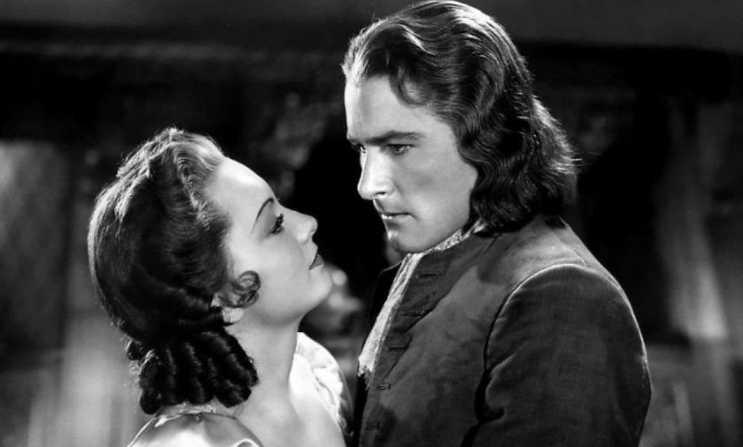 According to film historian Tony Thomas, both actors had “classic good looks, cultured speaking voices, and a sense of distant aristocracy about them.” Filmed between August 5 and October 29, 1935, Captain Blood gave de Havilland the opportunity to appear in her first costumed historical romance and adventure epic, a genre to which she was well suited, given her beauty and elegance. In the film, she played Arabella Bishop, the niece of a Jamaica plantation owner, who purchases at auction an Irish physician wrongly condemned to servitude. The on-screen chemistry between de Havilland and Flynn was evident from their first scenes together, where clashes between her character’s spirited hauteur and his character’s playful braggadocio did not mask their mutual attraction to each other. Unlike her two previous roles, Arabella is a feisty young woman who knows what she wants and is willing to fight for it. The bantering tone of their exchanges in the film‍—‌the healthy give-and-take and mutual respect‍—‌became the basis for their on-screen relationship in subsequent films. Captain Blood was released on December 28, 1935, and received good reviews and wide public appeal. De Havilland’s performance was singled out in The New York Times and Variety. The film was nominated for four Academy Awards, including Best Picture. The popular success of the film, as well as the critical response to the on-screen couple, led to seven additional collaborations. In 1936, de Havilland appeared in Mervyn LeRoy’s historical period drama Anthony Adverse with Fredric March. Based on the popular novel by Hervey Allen, the film follows the adventures of an orphan raised by a Scottish merchant, whose pursuit of fortune separates him from the innocent peasant girl he loves, marries, and eventually loses. De Havilland played the peasant girl Angela, who after being separated from her slave-trader husband, becomes opera star Mademoiselle Georges, the mistress of Napoleon. The film earned six Academy Award nominations, including Best Picture. It garnered de Havilland good exposure and the opportunity to portray a character as she develops over time. Howard Barnes of the New York Herald Tribune found her later scenes as Mademoiselle Georges “not very credible,” but Frank S. Nugent of The New York Times called her “a winsome Angela.” That same year, she was reunited with Flynn in Michael Curtiz’s period action film The Charge of the Light Brigade, set during the Crimean War which became a box office success. During the film’s production, de Havilland renegotiated her contract with Warner Bros. and signed a seven-year contract on April 14, 1936, with a starting weekly salary of five hundred dollars (equivalent to $8,600 in 2016). Toward the end of the year, 20-year-old de Havilland and her mother moved to 2337 Nella Vista Avenue in the Los Feliz section of Los Angeles. In 1937, de Havilland had her first top billing in Archie Mayo‘s comedy Call It a Day, about a middle-class English family struggling with the romantic effects of spring fever during the course of a single day. De Havilland played daughter Catherine Hilton, who falls in love with the handsome artist hired to paint her portrait. The film did not do well at the box office and did little to advance her career. She fared better in Mayo’s screwball comedy It’s Love I’m After with Leslie Howard and Bette Davis. De Havilland played Marcia West, a young debutante and theater fan enamored with a Barrymore-like matinee idol who decides to help the girl’s fiancé by pretending to be an abominable cad. The film received good reviews, with Variety calling it “fresh, clever, excellently directed and produced, and acted by an ensemble that clicks from start to finish,” and praising de Havilland. Despite the positive reviews, the film did not do as well at the box office. Her final film that year was Michael Curtiz‘s romantic drama Gold Is Where You Find It, a film about the late 19th-century conflict in the Sacramento Valley between gold miners and their hydraulic equipment and farmers whose land is being flooded. De Havilland played the daughter of a farmer, Serena Ferris, who falls in love with the mining engineer responsible for the flooding. The film was released in February 1938, and was her first appearance in three-strip Technicolor. In September 1937, de Havilland was selected by Warner Bros. studio head Jack L. Warner to play Maid Marian opposite Errol Flynn in The Adventures of Robin Hood (1938). The Technicolor production was filmed on location between September 26, 1937, and January 14, 1938, at Bidwell Park, Busch Gardens, and Lake Sherwood in California. Directed by William Keighley and Michael Curtiz, the film is about the legendary Robin Hood, a Saxon knight who opposes the corrupt and brutal Prince John and his Norman lords while good King Richard is away fighting in the Third Crusade. The king’s ward, Maid Marian, initially opposes Robin, but later supports him after learning his true intentions of helping his oppressed people. No mere bystander to events, Marian risks her life to save Robin by providing his men a plan for his escape. As defined by de Havilland, Marian is both a beautiful fairy-tale heroine and a spirited, intelligent woman “whose actions are governed by her mind as well as her heart,” according to author Judith Kass. The Adventures of Robin Hood was released on May 14, 1938, and was an immediate critical and commercial success, earning an Academy Award nomination for Best Picture. It went on to become one of the most popular adventure films of the Classical Hollywood era. The popularity of The Adventures of Robin Hood brought de Havilland a new level of fame as a movie star, but this new status was not reflected in her subsequent film assignments at Warner Bros. Her next several roles were more routine and less challenging. 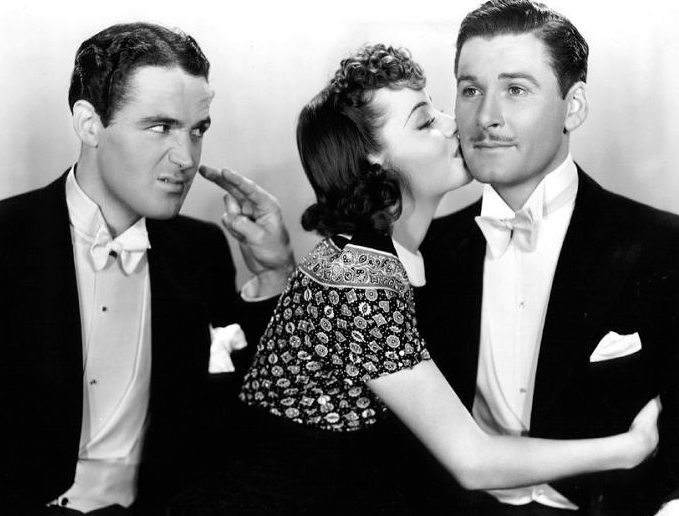 In the romantic comedy Four’s a Crowd (1938), de Havilland played Lorri Dillingwell, a dizzy rich girl being romanced by a conniving public relations man looking to land an account with her eccentric grandfather. In Ray Enright‘s romantic comedy Hard to Get (1938), she played another dizzy rich girl, Margaret Richards, whose desire to exact revenge on a gas station attendant leads to her own comeuppance. While de Havilland was certainly capable of playing these kinds of characters, her personality was better suited to stronger and more dramatic roles, according to Judith Kass. By this time, de Havilland had serious doubts about her career at Warner Bros. 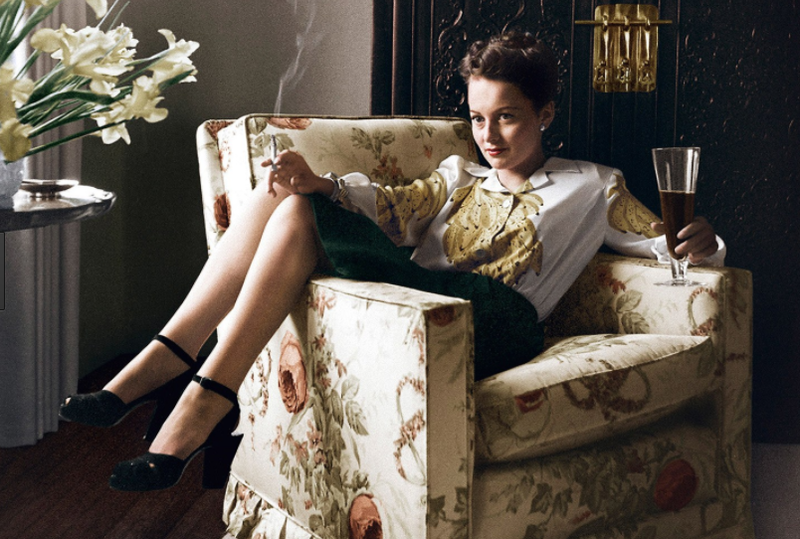 In a letter to a colleague dated November 18, 1938, film producer David O. Selznick wrote, “I would give anything if we had Olivia de Havilland under contract to us so that we could cast her as Melanie.” The film he was preparing to shoot was Gone with the Wind, and Jack L. Warner was unwilling to lend her out for the project. De Havilland had read the novel, and unlike most other actresses, who wanted the Scarlett O’Hara role, she wanted to play Melanie Hamilton‍—‌a character whose quiet dignity and inner strength she understood and felt she could bring to life on the screen. De Havilland turned to Warner’s wife Anne for help. Warner later recalled, “Olivia, who had a brain like a computer concealed behind those fawn-like eyes, simply went to my wife and they joined forces to change my mind.” Warner relented, and de Havilland was signed to the project a few weeks before the start of principal photography on January 26, 1939. Set in the American South during the 19th century, the film is about the strong-willed daughter of a Georgia plantation owner in love with the husband of her sister-in-law, Melanie, whose kindness stands in sharp contrast to those around her. According to film historian Tony Thomas, de Havilland’s skillful and subtle performance effectively presents this character of selfless love and quiet strength in a way that keeps her vital and interesting throughout the film. Gone with the Wind had its world premiere in Atlanta, Georgia, on December 15, 1939, and was well received. Frank S. Nugent of The Times wrote that de Havilland’s Melanie “is a gracious, dignified, tender gem of characterization,” and John C. Flinn, Sr., in Variety called her “a standout.” The film won 10 Academy Awards, including Best Picture, and de Havilland received her first nomination for Best Supporting Actress. Melanie was someone different. She had very, deeply feminine qualities … that I felt were very endangered at that time, and they are from generation to generation, and that somehow they should be kept alive, and … that’s why I wanted to interpret her role. … The main thing is that she was always thinking of the other person, and the interesting thing to me is that she was a happy person … loving, compassionate. That same year, de Havilland was reunited with Flynn in their sixth film together, Michael Curtiz’s Western adventure Santa Fe Trail, set against the backdrop of abolitionist John Brown’s fanatical antislavery attacks in the days leading up to the American Civil War. The mostly fictional story follows West Point cadets J. E. B. Stuart, played by Flynn, and George Armstrong Custer, played by Ronald Reagan, as they make their way west, both vying for the affection of de Havilland’s Kit Carson Halliday. Unlike some of her previous adventure film roles, Kit is a vital, interesting, and confident character who knows her mind and plays a pivotal role in the story. Playing Kit in a provocative, tongue-in-cheek manner, de Havilland creates a character of real substance and dimension, according to Tony Thomas. Following a world premiere on December 13, 1940, at the Lensic Theatre in Santa Fe, New Mexico‍—‌attended by cast members, reporters, the governor, and over 60,000 fans‍—‌Santa Fe Trail went on to become one of the top-grossing films of 1940. 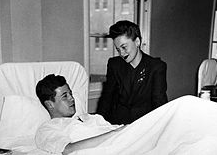 De Havilland, who accompanied Flynn on the well-publicized train ride to Santa Fe, did not attend the premiere, having been diagnosed with appendicitis that morning and rushed into surgery. Following her emergency surgery, de Havilland began a long period of convalescence in a Los Angeles hospital during which time she rejected several scripts offered to her by Warner Bros., leading to another suspension. In 1941, she appeared in three commercially successful films, beginning with Raoul Walsh’s romantic comedy The Strawberry Blonde with James Cagney. Set during the Gay Nineties, the story involves a man who marries an outspoken advocate for women’s rights after a rival steals his glamorous “strawberry blonde” girlfriend, and later discovers he ended up with a loving and understanding wife. Her performance revealed a growing confidence playing comedic roles, and a real talent for combining the qualities of kindness and love with a refined sense of naughtiness, according to film historian Tony Thomas. The film was a critical and commercial success. In Mitchell Leisen’s romantic drama Hold Back the Dawn with Charles Boyer for Paramount Pictures, de Havilland transitioned to a different type of role for her‍—‌an ordinary, decent small-town teacher whose life and sexuality are awakened by a sophisticated European gigolo, whose own life is positively affected by her love. Leisen’s careful direction and guidance appealed to de Havilland‍—‌much more than the workman-like approach of her Warner Bros. directors. 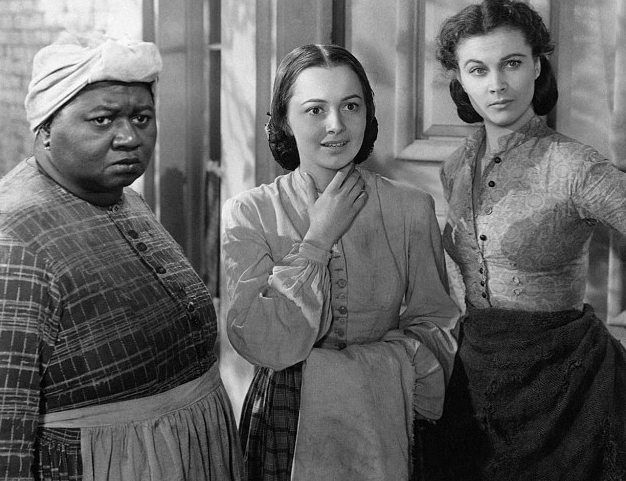 Bosley Crowther of The New York Times wrote, “Olivia de Havilland plays the school teacher as a woman with romantic fancies whose honesty and pride are her own‍—‌and the film’s‍—‌chief support. Incidentally, she is excellent.” Her performance earned de Havilland her second Academy Award nomination‍—‌this time for Best Actress. In July 1941, de Havilland was reunited with Errol Flynn for their eighth movie together, Raoul Walsh‘s epic They Died with Their Boots On. The film is loosely based on the courtship and marriage of George Armstrong Custer and Elizabeth “Libbie” Bacon. Flynn and de Havilland had a falling out the previous year‍—‌mainly over the roles she was being given‍—‌and she did not intend to work with him again. Even Flynn acknowledged, “She was sick to death of playing ‘the girl’ and badly wanted a few good roles to show herself and the world that she was a fine actress.” After she learned from Warner that Flynn had come to his office saying he needed her in the film, de Havilland accepted. Screenwriter Lenore Coffee was brought in to add several romantic scenes, and improve the overall dialogue. The result is a film that includes some of their finest work together. Their last appearance on screen is Custer’s farewell to his wife. “Errol was quite sensitive,” de Havilland would later remember, “I think he knew it would be the last time we worked together.” Flynn’s final line in that scene would hold special meaning for her: “Walking through life with you, ma’am, has been a very gracious thing.” They Died with Their Boots On was released on November 21, 1941, and while some reviewers criticized the film’s historical inaccuracies, most applauded the action sequences, cinematography, and acting. Thomas M. Pryor of The New York Times found de Havilland “altogether captivating.” The film went on to earn $2,550,000 (equivalent to $41,500,000 in 2016), Warner Bros’ second-biggest money-maker of that year. In 1942, de Havilland appeared in Elliott Nugent‘s romantic comedy The Male Animal with Henry Fonda, about an idealistic professor fighting for academic freedom while trying to hold onto his job and his wife Ellen. While her role was not particularly challenging, de Havilland’s delineation of an intelligent, good-natured woman trying to resolve the unsettling circumstances of her life played a major part in the film’s success, according to Tony Thomas. The film was a critical and commercial success, with Bosley Crowther of The Times noting that de Havilland “concocts a delightfully pliant and saucy character as the wife.” That year, she also appeared in John Huston‘s drama In This Our Life with Bette Davis. Based on the Pulitzer Prize-winning novel of the same name by Ellen Glasgow, the story is about two sisters whose lives are destroyed by the anger and jealousy of one of the sisters. Crowther gave the film a negative review, but noted de Havilland’s “warm and easy performance.” During production, de Havilland and Huston began a romantic relationship that lasted three years. After fulfilling her seven-year Warner Bros. contract in 1943, de Havilland was informed that six months had been added to her contract for the times that she had been suspended. At the time, the studios had adopted the position that California law allowed them to suspend contract players for rejecting a role, and the period of suspension could be added to the contract period. Most contract players accepted this, but a few tried to change the system, including Bette Davis, who mounted an unsuccessful lawsuit against Warner Bros. in the 1930s. On August 23, 1943, acting on the advice of her lawyer, Martin Gang, de Havilland took Warner Bros. to court, citing an existing section of the California Labor Code that forbade an employer from enforcing a contract against an employee for longer than seven years from the date of first performance. In November 1943, the California Superior Court found in de Havilland’s favor, and Warner Bros. immediately appealed. On December 8, 1944, the California Court of Appeal for the Second District ruled in her favor. The decision was one of the most significant and far-reaching legal rulings in Hollywood, reducing the power of the studios and extending greater creative freedom to performers. California’s resulting “seven-year rule,” also known as Labor Code Section 2855, is still known today as the De Havilland Law. Her legal victory, which cost her $13,000 (equivalent to $180,000 in 2016) in legal fees, won de Havilland the respect and admiration of her peers, among them her own sister Joan Fontaine, who later commented, “Hollywood owes Olivia a great deal.” Warner Bros. reacted to de Havilland’s lawsuit by circulating a letter to other studios that had the effect of a “virtual blacklisting.” As a consequence, de Havilland did not work at a film studio for nearly two years. After the California Court of Appeals ruling freed her from her Warner Bros. contract, de Havilland signed a two-picture deal with Paramount Pictures. In June 1945, she began filming Mitchell Leisen’s drama To Each His Own, about an unwed mother who gives up her child for adoption and then spends the rest of her life trying to undo that decision. De Havilland insisted on bringing in Leisen as director, trusting his eye for detail, his empathy for actors, and the way he controlled sentiment in their previous collaboration, Hold Back the Dawn. The role required de Havilland to age nearly 30 years over the course of the film‍—‌from an innocent, small-town girl to a shrewd, ruthless businesswoman devoted to her cosmetics company. While de Havilland never formally studied acting, she did read Stanislavsky’s autobiography My Life in Art and applied one of his “methods” for this role. To help her define her character during the four periods of the story, she used a different perfume for each period. She also lowered the pitch of her voice incrementally in each period until it became a mature woman’s voice. Her performance earned her the Academy Award for Best Actress in 1946‍—‌her first Oscar. According to film historian Tony Thomas, the award represented a vindication of her long struggle with Warner Bros. and confirmation of her abilities as an actress. Her next two roles were challenging. In Robert Siodmak’s psychological thriller The Dark Mirror (1946), de Havilland played twin sisters Ruth and Terry Collins‍—‌one loving and normal, the other psychotic. 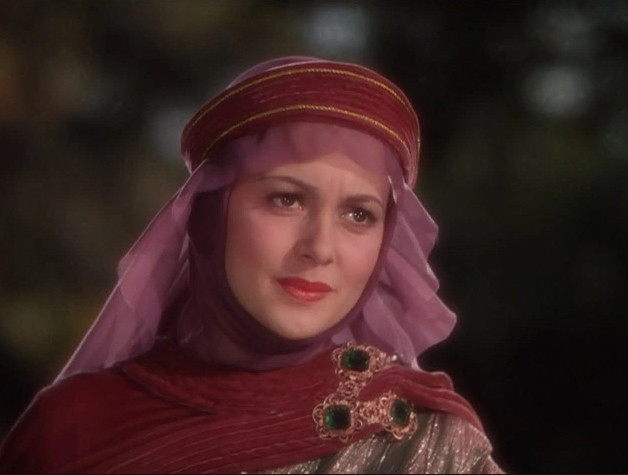 In addition to the technical problems of showing her as two characters interacting with each other on screen at the same time, de Havilland needed to portray two separate and psychologically opposite people. 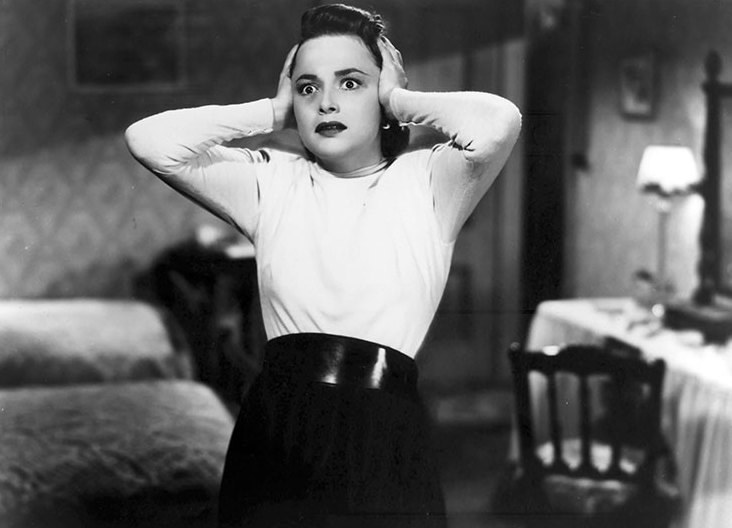 While the film was not well received by critics‍—‌Variety said the film “gets lost in a maze of psychological gadgets and speculation”‍—‌de Havilland’s performance was praised by Tony Thomas, who called her final scene in the film “an almost frighteningly convincing piece of acting.” De Havilland later stated that playing the evil sister haunted her for years. In his review in The Nation, James Agee wrote that “her playing is thoughtful, quiet, detailed, and well sustained, and since it is founded, as some more talented playing is not, in an unusually healthful-seeming and likable temperament, it is an undivided pleasure to see.” While appearing in a summer stock production of What Every Woman Knows in Westport, Connecticut, her second professional stage appearance, de Havilland began dating Marcus Goodrich, a Navy veteran, journalist, and author of the 1941 novel Delilah. They were married on August 26, 1946. De Havilland was praised for her performance as Virginia Cunningham in Anatole Litvak‘s drama The Snake Pit (1948), one of the first films to attempt a realistic portrayal of mental illness and an important exposé of the harsh conditions in state mental hospitals, according to film critic Philip French. Based on a novel by Mary Jane Ward and produced by Darryl F. Zanuck, the film is about a woman placed in a mental institution by her husband to help her recover from a nervous breakdown. Virginia Cunningham was one of the most difficult of all her film roles, requiring significant preparation both mentally and physically‍—‌she deliberately lost weight to help create her gaunt appearance on screen. She consulted regularly with psychiatrists hired as consultants for the film, and visited Camarillo State Mental Hospital to research her role and observe the patients. The extreme physical discomfort of the hydrotherapy and simulated electric shock therapy scenes were especially challenging for the slight 5-foot-3-inch (160 cm) actress. In her performance, she conveyed her mental anguish by physically transforming her face with furrowed brow, wild staring eyes, and grimacing mouth. I met a young woman who was very much like Virginia, about the same age and physical description, as well as being a schizophrenic with guilt problems. … What struck me most of all was the fact that she was rather likable and appealing. It hadn’t occurred to me before that a mental patient could be appealing, and it was that that gave me the key to the performance. According to author Judith Kass, de Havilland delivered a performance both “restrained and electric,” portraying varied and extreme aspects of her character‍—‌from a shy young woman to a tormented and disoriented woman. 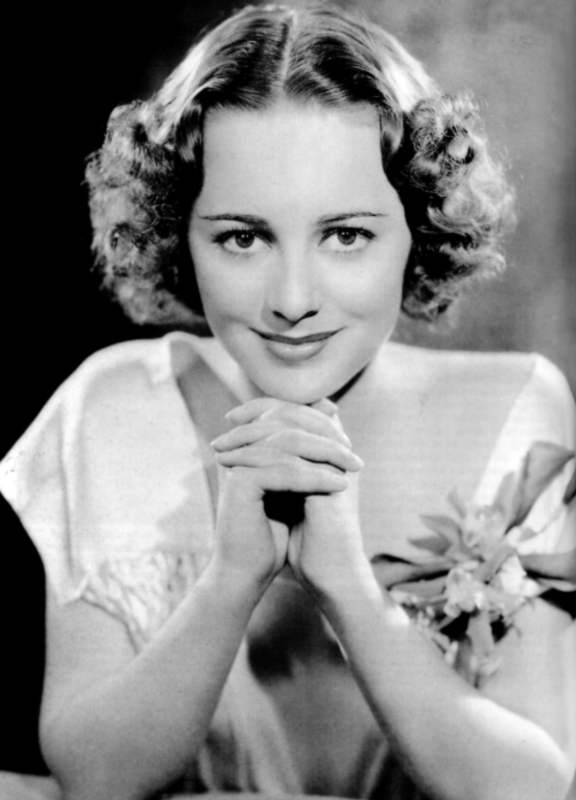 For her performance in The Snake Pit, de Havilland received an Academy Award nomination for Best Actress, the New York Film Critics Circle Award for Best Actress, and the Venice Film Festival Volpi Cup. In 1949, de Havilland appeared in William Wyler‘s period drama The Heiress (1949), the fourth in a string of critically acclaimed performances. 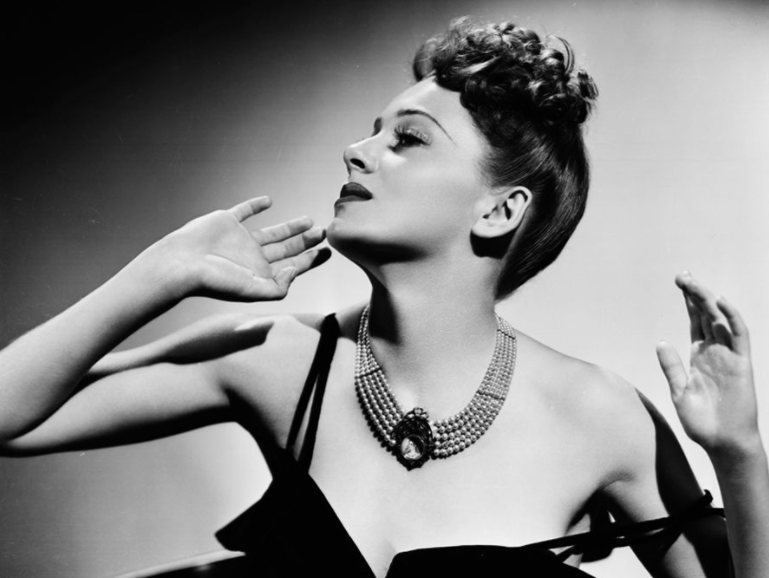 After seeing the play on Broadway, de Havilland called Wyler and urged him to fly to New York to see what she felt would be a perfect role for her. Wyler obliged, loved the play, and with de Havilland’s help arranged for Paramount to secure the film rights. Adapted for the screen by Ruth and Augustus Goetz and based on the 1880 novel Washington Square by Henry James, the film is about a young naïve woman who falls in love with a young man, over the objections of her emotionally abusive father, who suspects the man of being a gold digger. As she had done in Hold Back the Dawn, de Havilland portrays a character’s transformation from a shy, trusting innocent to a guarded, mature woman over a period of years. Her delineation of Catherine Sloper is developed through carefully crafted movements, gestures, and facial expressions that convey a submissive and inhibited young woman. Her timid voice, nervous hands, downcast eyes, and careful movements all communicate what the character is too shy to verbalize. Throughout the production, Wyler pressed de Havilland hard to elicit the requisite visual points of the character. In the scene where Catherine returns home after being jilted, the director had the actress carry a suitcase filled with heavy books up the stairs to convey the weight of Catherine’s trauma physically instead of using a planned speech in the original script. The Heiress was released in October 1949 and was well received by critics. 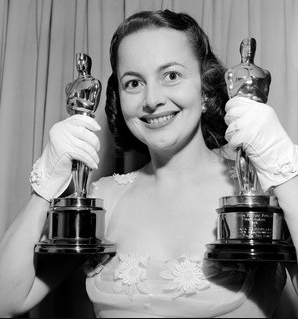 For her performance, de Havilland received the New York Film Critics Award, the Golden Globe Award, and the Academy Award for Best Actress‍—‌her second Oscar. After giving birth to her first child, Benjamin, on September 27, 1949, de Havilland took time off from making films to be with her infant. She turned down the role of Blanche DuBois in A Streetcar Named Desire, later explaining that becoming a mother was a “transforming experience” and that she could not relate to the character. In 1950, her family moved to New York City, where she began rehearsals for a major new stage production of Shakespeare’s Romeo and Juliet; it was her lifelong ambition to play Juliet on the stage. The play opened at the Broadhurst Theatre on March 11, 1951, to mixed reviews, with some critics believing the 35-year-old actress was too old for the role. The play closed after 45 performances. Undaunted, de Havilland accepted the title role in the stage production of George Bernard Shaw’s comedy Candida, which opened at the National Theatre on Broadway in April 1952. While reviews of the play were mixed, de Havilland’s performance was well received, and following the scheduled 32 performances, she went on tour with the company and delivered 323 additional performances, many to sold-out audiences. While de Havilland achieved major accomplishments during this period of her career, her marriage to Goodrich, 18 years her senior, had grown strained due to his unstable temperament. In August 1952, de Havilland filed for divorce, which became final the following year. Of course the thing that staggers you when you first come to France is the fact that all the French speak French‍—‌even the children. Many Americans and “Britishers” who visit the country never quite adjust to this, and the idea persists that the natives speak the language just to show off or be difficult. 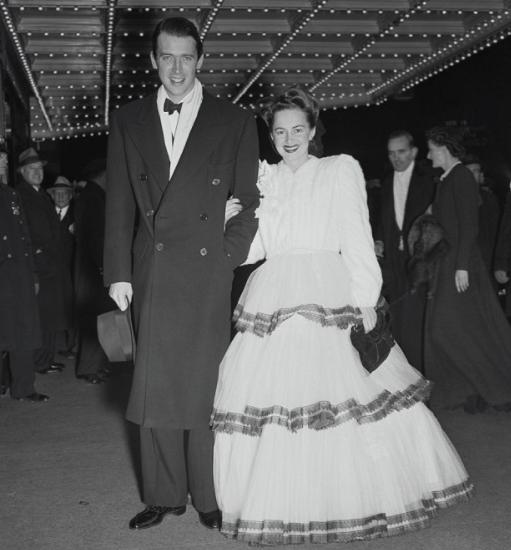 In April 1953, at the invitation of the French government, de Havilland traveled to the Cannes Film Festival, where she met Pierre Galante, an executive editor for the French journal Paris Match. Following a long-distance courtship and the requisite nine-month residency requirement, de Havilland and Galante married on April 2, 1955, in the village of Yvoy-le-Marron, and settled together in a three-story house near Bois de Boulogne park in the Rive Droite section of Paris. That same year, de Havilland returned to the screen in Terence Young’s period drama That Lady (1955), about a Spanish princess and her unrequited love for King Philip II of Spain, whose respect she earned in her youth after losing an eye in a sword fight defending his honor. According to Tony Thomas, the film uses authentic Spanish locations effectively, but suffers from a convoluted plot and excessive dialogue, and while de Havilland delivered a warm and elegant performance as Ana de Mendoza, the film was disappointing. Following her appearances in the romantic melodrama Not as a Stranger (1955) and The Ambassador’s Daughter(1956)—‌neither of which were successful at the box office‍—‌de Havilland gave birth to her second child, Gisèle Galante, on July 18, 1956. One of de Havilland’s most noted performances during this period was in Guy Green’s romantic drama Light in the Piazza (1962) with Rossano Brazzi. Filmed in Florence and Rome, and based on Elizabeth Spencer’s novel of the same name, the film is about a middle-class American tourist on extended vacation in Italy with her beautiful 26-year-old daughter, who is mentally disabled as a result of a childhood accident. Faced with the prospect of her daughter falling in love with a young Italian, the mother struggles with conflicting emotions about her daughter’s future. In early 1962, de Havilland traveled to New York and began rehearsals for Garson Kanin‘s stage play A Gift of Time. Adapted from the autobiographical book Death of a Man by Lael Tucker Wertenbaker, the play explores the emotionally painful struggle of a housewife forced to deal with the slow death of her husband, played by Henry Fonda. The play opened at the Ethel Barrymore Theatre on Broadway to positive notices, with de Havilland receiving her best reviews as a stage actress. Theater critic Walter Kerr praised her final scene, writing, “As darkness gathers, the actress gains in stature, taking on the simple and resolute willingness to understand.” The New York World Telegram and Sun reviewer concluded, “It is Miss de Havilland who gives the play its unbroken continuity. This distinguished actress reveals Lael as a special and admirable woman.” She stayed with the production for 90 performances. The year 1962 also had the publication of de Havilland’s first book, Every Frenchman Has One, a lighthearted account of her often amusing attempts to understand and adapt to French life, manners, and customs. The book sold out its first printing prior to the publication date and went on to become a bestseller. In 1964, de Havilland appeared in her last two leading roles in feature films‍—‌both psychological thrillers. In Walter Grauman‘s Lady in a Cage, she played a wealthy poet who gets trapped in her mansion’s elevator and faces the threat of three terrorizing hooligans in her own home. Critics responded negatively to the graphic violence and cruelty shown on screen. 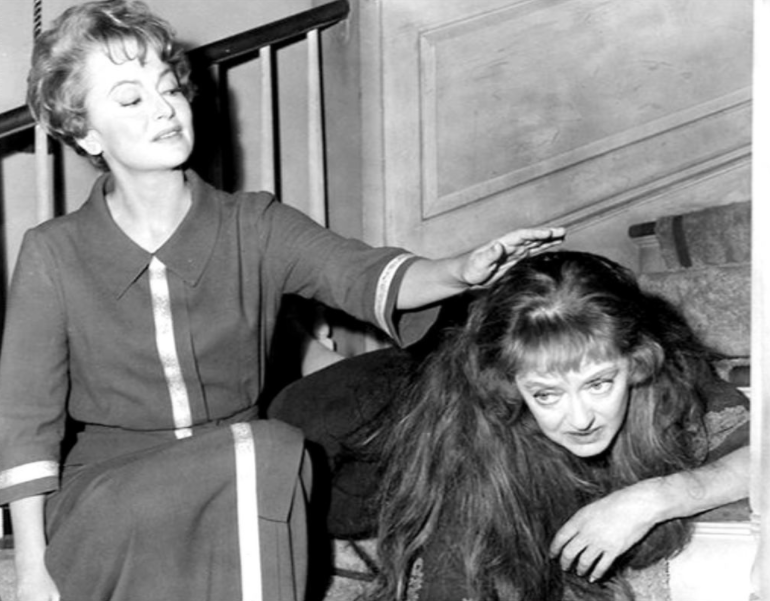 A. H. Weiler of The New York Times called it a “sordid, if suspenseful, exercise in aimless brutality.” That same year, de Havilland appeared in Robert Aldrich’s Hush… Hush, Sweet Charlotte with her close friend Bette Davis. After Joan Crawford left the picture due to illness, Davis had Aldrich fly to Switzerland to persuade a reluctant de Havilland to accept the role of Miriam Deering, a cruel, conniving character hidden behind the charming façade of a polite and cultured lady. De Havilland’s quiet, restrained performance provided a counterbalance to Davis’s ranting characterization. Film historian Tony Thomas described her performance as “a subtle piece of acting” that was “a vital contribution to the effectiveness of the film.” The film was well received and earned seven Academy Award nominations. As film roles became more difficult to find, a common problem shared by many Hollywood veterans from her era, de Havilland began working in television dramas, despite her dislike of the networks’ practice of breaking up story lines with commercials. Her first venture into the medium was a teleplay directed by Sam Peckinpah called NoonWine (1966) on ABC Stage 67, a dark tragedy about a farmer’s act of murder that leads to his suicide. The production and her performance as the farmer’s wife Ellie were well received. In 1972, she starred in her first television feature film, The Screaming Woman, about a wealthy woman recovering from a nervous breakdown. In 1979, she appeared in the ABC miniseries Roots: The Next Generations in the role of Mrs. Warner, the wife of a former Confederate officer played by Henry Fonda. The miniseries was seen by an estimated 110 million people‍—‌nearly one-third of American homes with television sets. Throughout the 1970s, de Havilland’s film work was limited to smaller supporting roles and cameo appearances. Her last feature film was The Fifth Musketeer (1979). During this period, de Havilland began doing speaking engagements in cities across the United States with a talk entitled “From the City of the Stars to the City of Light”, a program of personal reminiscences about her life and career. She also attended tributes to Gone with the Wind. In the 1980s, her television work included an Agatha Christie television film Murder Is Easy (1982), the television drama The Royal Romance of Charles and Diana (1982) in which she played the Queen Mother, and the 1986 ABC miniseries North and South, Book II. Her most notable performance of the decade was in the television film Anastasia: The Mystery of Anna (1986) as Dowager Empress Maria, which earned her a Golden Globe Award for Best Supporting Actress in a Series, Miniseries or Television Film. In 1988, de Havilland appeared in the HTV romantic television drama The Woman He Loved; it was her final screen performance. In retirement, de Havilland remained active in the film community. In 1998, she traveled to New York to help promote a special showing of Gone with the Wind. In 2003, she appeared as a presenter at the 75th Academy Awards. 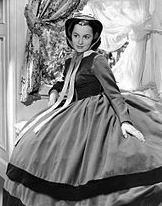 In 2004, Turner Classic Movies produced a retrospective piece called Melanie Remembers in which she was interviewed for the 65th anniversary of the original release of Gone with the Wind. In June 2006, she made appearances at tributes commemorating her 90th birthday at the Academy of Motion Picture Arts and Sciences and the Los Angeles County Museum of Art. On November 17, 2008, at the age of 92, de Havilland received the National Medal of Arts, the highest honor conferred to an individual artist on behalf of the people of the United States. The medal was presented to her by President George W. Bush, who commended her “for her persuasive and compelling skill as an actress in roles from Shakespeare’s Hermia to Margaret Mitchell’s Melanie. 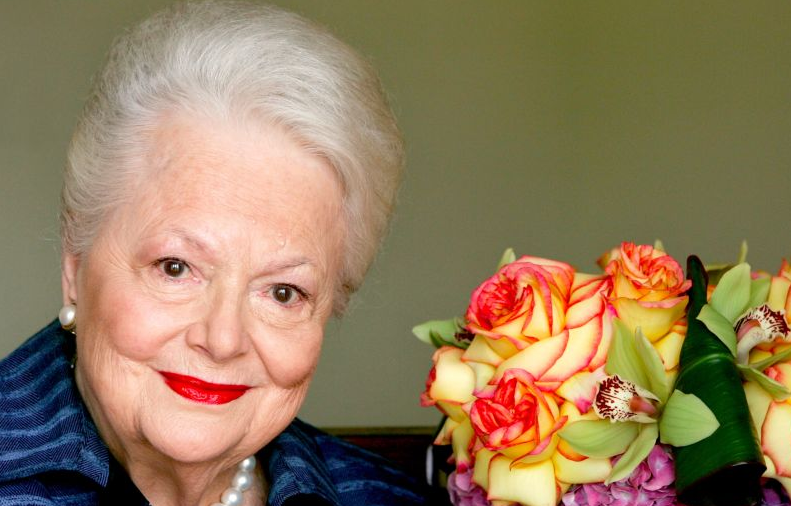 Her independence, integrity, and grace won creative freedom for herself and her fellow film actors.” The following year, de Havilland narrated the documentary I Remember Better When I Paint (2009), a film about the importance of art in the treatment of Alzheimer’s disease. On September 9, 2010, de Havilland was appointed a Chevalier (knight) of the Légion d’honneur, the highest decoration in France, awarded by French President Nicolas Sarkozy, who told the actress, “You honor France for having chosen us.” In February the following year, she appeared at the César Awards in France, where she was greeted with a standing ovation. De Havilland celebrated her 100th birthday on July 1, 2016. Although known as one of Hollywood’s most exciting on-screen couples, de Havilland and Errol Flynn were never involved in a romantic relationship. Upon first meeting her at Warner Bros. in August 1935, Flynn was drawn to the 19-year-old actress with “warm brown eyes” and “extraordinary charm.” In turn, de Havilland fell in love with him, but kept her feelings inside, later recalling, “He never guessed I had a crush on him … it never occurred to me that he was smitten with me, too.” Flynn later wrote, “By the time we made The Charge of the Light Brigade, I was sure that I was in love with her.” Flynn finally professed his love on March 12, 1937, at the Coronation Ball for King George VI at the Ambassador Hotel in Los Angeles, where they slow danced together to “Sweet Leilani” at the hotel’s Coconut Grove nightclub. “I was deeply affected by him,” she later remembered, “It was impossible for me not to be.” The evening ended on a sobering note, however, with de Havilland insisting that despite his separation from his wife Lili Damita, he needed to divorce her before their relationship could proceed. Flynn reunited with his wife later that year, and de Havilland never acted on her feelings for Flynn. On August 26, 1946, she married Marcus Goodrich, a Navy veteran, journalist, and author of the 1941 novel Delilah. The marriage ended in divorce in 1953. They had one child, Benjamin Goodrich, who was born on September 27, 1949. He was diagnosed with Hodgkin’s lymphoma at the age of 19, but was able to graduate from the University of Texas. He worked as a statistical analyst for Lockheed Missiles and Space Company in Sunnyvale, California, and as an international banking representative for the Texas Commerce Bank in Houston. He died on October 1, 1991, in Paris at the age of 41 of heart disease brought on by treatments for Hodgkin’s disease, three weeks before the death of his father. On April 2, 1955, de Havilland married Pierre Galante, an executive editor for the French journal Paris Match. Her marriage to Galante prompted de Havilland to move to Paris. The couple separated in 1962, but continued to live in the same house for another six years to raise their daughter together. Galante moved across the street and the two remained close, even after the finalization of the divorce in 1979. She looked after him during his final bout with lung cancer prior to his death in 1998. They had one child, Gisèle Galante, who was born on July 18, 1956. After studying law at the Université de Droit de Nanterre School of Law, she worked as a journalist in France and the United States. Since 1956, de Havilland has lived in the same three-story house near Bois de Boulogne park in the Rive Droite section of Paris. De Havilland was raised in the Episcopal Church and has remained an Episcopalian throughout her life. After moving to France, she became one of the first women lectors at the American Cathedral in Paris, where she was on the regular rota for Scripture readings. As recently as 2012, she was still doing readings on major feast days, including Christmas and Easter. “It’s a task I love,” she once said. In describing her preparation for her readings, de Havilland once observed, “You have to convey the deep meaning, you see, and it has to start with your own faith. But first I always pray. I pray before I start to prepare, as well. In fact, I would always say a prayer before shooting a scene, so this is not so different, in a way.” De Havilland prefers to use the Revised English Bible for its poetic style. She raised her son Benjamin in the Episcopal Church and her daughter Gisèle in the Roman Catholic Church, the faith of the child’s father. She organized a fight to regain control of the committee from its pro-Soviet leadership, but her reform efforts failed. Her resignation from the committee triggered a wave of resignations from 11 other Hollywood figures, including future President Ronald Reagan. In 1958, she was secretly called before the House Un-American Activities Committee and recounted her experiences with the Independent Citizens’ Committee. De Havilland was the first to become an actress, and for several years Fontaine was overshadowed by her sister’s accomplishments. When Mervyn LeRoy offered Fontaine a personal contract, her mother told her that Warner Bros. was “Olivia’s studio” and that she could not use the family name, “de Havilland.” In 1942, de Havilland and Fontaine were both nominated for an Academy Award for Best Actress‍—‌de Havilland for Hold Back the Dawn and Fontaine for Suspicion. When Fontaine’s name was announced as winner, de Havilland reacted graciously saying, “We’ve got it!” According to biographer Charles Higham, Fontaine rejected de Havilland’s attempts to congratulate her, leaving the other offended and embarrassed. Their relationship was further strained in 1946 when Fontaine made negative comments to an interviewer about de Havilland’s new husband, Marcus Goodrich. When she read her sister’s remarks, de Havilland was deeply hurt and waited for an apology that was never offered. The following year after accepting her first Academy Award for To Each His Own, de Havilland was approached backstage by Fontaine, who extended her hand to congratulate her; de Havilland turned away from her sister. The two did not speak for the next five years after the incident. This may have caused an estrangement between Fontaine and her own daughters, who maintained a covert relationship with their aunt, de Havilland. Following her divorce from Goodrich, de Havilland resumed contact with her sister, coming to her apartment in New York and spending Christmas together there in 1961. The final break between the sisters occurred in 1975 over disagreements over their mother’s cancer treatment‍—‌de Havilland wanted to consult other doctors and supported exploratory surgery; Fontaine disagreed. Fontaine claimed that de Havilland did not notify her of their mother’s death while she was touring with a play‍—‌de Havilland in fact had sent a telegram, which took two weeks to reach her sister. The sibling feud ended with Fontaine’s death on December 15, 2013. The following day, de Havilland released a statement saying she was “shocked and saddened” by the news. De Havilland’s career spanned 53 years, from 1935 to 1988. During that time, she appeared in 49 feature films, and was one of the leading movie stars during the golden age of Classical Hollywood. She began her career playing demure ingénues opposite popular male stars, including Errol Flynn, with whom she made her breakout film Captain Blood in 1935. They would go on to make eight more feature films together, and became one of Hollywood’s most popular romantic on-screen pairings. Her range of performances included roles in most major movie genres. Following her film debut in the Shakespeare adaptation A Midsummer Night’s Dream, de Havilland achieved her initial popularity in romantic comedies, such as The Great Garrick and Hard to Get, and Western adventure films, such as Dodge City and Santa Fe Trail. In her later career, she was most successful in drama films, such as In This Our Life and Light in the Piazza, and psychological dramas playing non-glamorous characters in films such as The Dark Mirror, The Snake Pit, and Hush… Hush, Sweet Charlotte. In 2006, she was inducted into the Online Film & Television Association Award Film Hall of Fame. On November 17, 2008, President George W. Bush presented de Havilland the National Medal of Arts, the highest honor given for achievement in the arts conferred to an individual artist on behalf of the American people. On September 9, 2010, de Havilland was appointed a Chevalier (knight) of the Légion d’honneur, the highest decoration in France, awarded by French President Nicolas Sarkozy. The moving-image collection of Olivia de Havilland is held at the Academy Film Archive, which preserved a nitrate reel of a screen test for Danton, Max Reinhardt’s never-produced follow-up to A Midsummer Night’s Dream (1935). de Havilland, as a confidante and friend of Bette Davis, is featured in the series Feud: Bette and Joan, portrayed by Catherine Zeta-Jones. In the series de Havilland reflects on the origins and depth of the Davis–Crawford feud and how it affected contemporary female Hollywood stars.